Evergreen plant in the daisy family with finely divided, pinnately compound foliage and orange-yellow flowers during most of the year, but in particular during autumn and winter. The leaves have a strong fragrance, somewhat like the scent of passionfruit (according to some the foliage smells like a combination of marigold, lemon, and mint). Oils in the plant may cause skin irritation in some people. Attracts bees and butterflies. Discovered in Arizona by plant collectors John and Sara Lemmon in the late 1800s. Its natural habitat stretches south from Arizona down to norther Mexico. Tagetes lemmonii does best in a sunny position in well-draining soil. Becomes leggy when it doesn't receive enough sunlight. In very hot climates, a partially shaded position is best. Drought-tolerant, but prefers some regular irrigation. Avoid over-watering. Easy to propagate from cuttings, and can also be divided or propagated from seed. Tolerates moderate frosts (zones 8-11). Although some frost damage may occur in zone 8, the plant will bounce back in spring. Trim once a year to keep the plant compact. Tagetes lemmonii is supposed to flower in response to short days, but in my garden it has been in flower since it was large enough in spring and now, mid-summer, it is still covered with flowers. Each time I photograph this plant I am disappointed to find that the flower colour in the photo appears more yellow than orange, whereas in reality the flowers look more orange than yellow to me. The plant has a lovely, somewhat whimsical appearance. 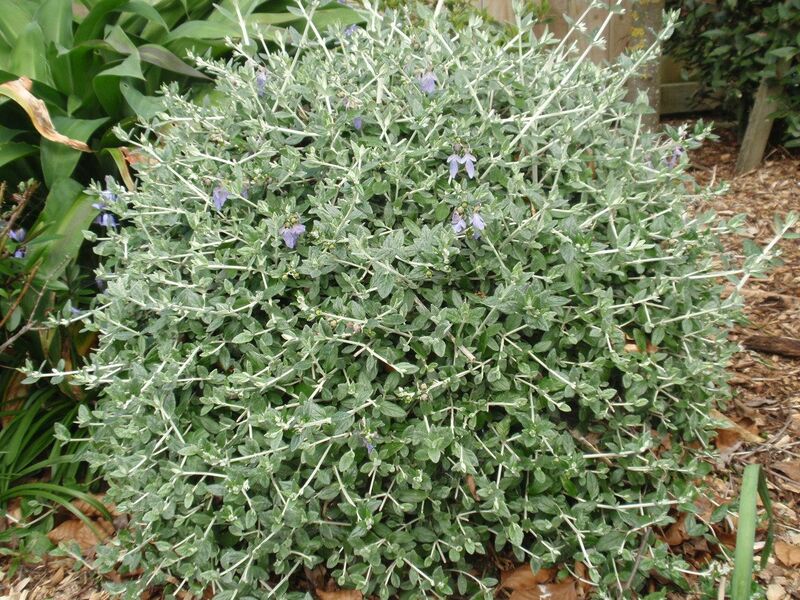 Evergreen shrub with grey-green foliage, pale lilac-blue flowers, and a somwhat angular branching pattern. Native to Spain, Portugal, Italy and north Africa. Stems and undersides of leaves are covered with tiny white hairs giving the plant a silvery-grey overall appearance. Leaves are ovate to lance-shaped, 2-3 cm long. The pale lilac-blue flowers are two-lipped, and 2.5 cm long. Prefers a sunny position in well-drained soil. Tolerates poor soils, dry conditions, and moderate frosts. Suitable for coastal plantings. Prune to keep compact or to create a specific shape. Mainly grown for its attractive silvery colour. If you are particularly interested in a good display of flowers then the cultivar 'Azureum' with a much stronger colour contrast between flowers and foliage is a better choice. This cultivar combines well with other blue-flowering shrubs. The flowers of Teucrium fruticans itself fit in better with purple colour schemes. Evergreen shrub with grey-green foliage and blue flowers. Stems and undersides of leaves are covered with dense white hairs, giving the plant a silvery grey overall appearance. Leaves are ovate to lance-shaped, 2-3 cm long. Azure blue, two-lipped flowers, 2.5 cm long, mainly during summer. Teucrium fruticans (shrubby germander, bush germander) itself is native to Spain, Portugal, Italy and North Africa, and has pale lilac flowers. Prefers a sunny position in well-drained soil. Tolerates poor soils, dry conditions and medium frosts. Suitable for coastal plantings. Mainly grown for its attractive silvery colour, which forms a beautiful contrast with the deep blue flowers. Can be pruned to any shape. A regular prune is a good idea since otherwise growth is somewhat lax, and its young foliage looks better than the older leaves. Cultivar of the Iranian wood sage or Caucasian germander, a clump-forming sub-shrub with soft, downy stems and leaves, native to western Asia and the Caucasus region.Teucrium hircanicum 'Purple Tails' has oblong to ovate leaves in opposite pairs, 5-10 cm long, with rounded teeth along the margins, and a somewhat wrinkly upper surface. Reddish purple flowers appear during early summer, tightly packed in long spikes, 15-30 cm long, gradually opening and colouring up from the base of the inflorescence. Prefers a sunny or partially shaded position in any well-draining soil. Does not like wet feet. Cut back after flowering to keep compact. The stems can become relatively floppy and get blown about in the wind, so unless planted in a sheltered position, some support may be required. Self-seeds. Dramatic display of vertical spikes in stunning colours set off beautifully by the mid green foliage. Looks great in groups in the middle or the back of borders. Makes a lovely combination with the dark reddish purple young foliage of Hebe 'Pretty in Pink'. Alternatively, combine with other purple-flowering plants and an occasional yellow highlight. Select plants with contrasting flower shapes. Spreading, low mound-forming thyme with aromatic, light green to golden green leaves. Small clusters of lilac flowers in summer, but not as free-flowering as some of the other thymes. Sometimes sold as Thymus x citriodorus 'Bertram Anderson' or Thymus x citriodorus 'Anderson's Gold'. Prefers a sunny position in well-draining soil. Well suited to areas with dry, sandy soils. Water regularly until established. Tolerates occasional foot traffic. Frost hardy (zones 4-9). Suitable for coastal gardens. Gives a lovely, mild thyme flavour in cooking. The foliage is attractive all year round, and appears lime green from a distance. Combines beautifully with purple sage or other purple-leafed plants. 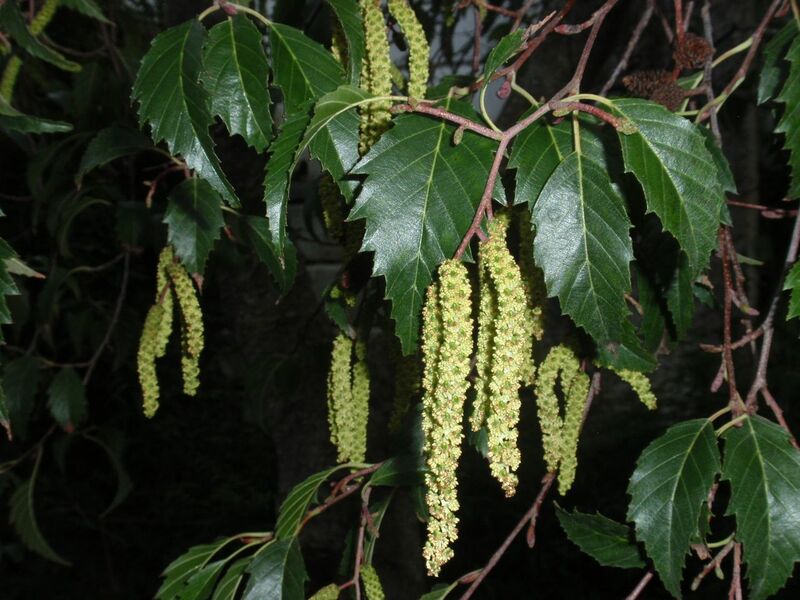 Bushy shrub or small tree with rounded crown, reaching 3-5m tall. Rich purple flowers 5 to 7 cm across, emerging from reddish, hairy buds during late summer and autumn. Slightly hairy, oblong to ovate leaves, 5 to 10 cm long, with conspicuous veins. Reddish and hairy young stems. Native to Brazil. Frost tender when young. Tolerates light to medium frosts when established. Needs protection from strong winds. Synonyms: Tibouchina semidecandra and Lasiandra semidecandra. Herbaceous perennial originating from the Mediterranean region with toothed, oval leaves, and small purple, slightly scented flowers in domed clusters (8-15 cm wide) during summer. The common name alludes to the fact that the plant was thought to have medicinal powers and used as a gargle for sore throats. Prefers a sunny position in any well-draining, fertile soil. Although Trachelium caeruleum prefers an average supply of moisture, it can handle quite dry conditions. Cut back after flowering. Self-seeds readily and flowers in its first year from seed. Usually pest and disease free. Lasts for about 2 weeks as a cut flower. Flowers are ready for picking when 1/4 to 1/3 of the florets are open. Tolerates light-medium frosts (to about -7 deg Celsius, zones 9-11). Often grown as an annual in colder climates. Suitable for coastal gardens. In the photo Trachelium caeruleum is growing in a pot together with Agapanthus, resulting in a beautiful colour combination when both are flowering at the same time. Trachelium is also suitable for the flower border, and looks great in combination with either yellow (e.g. dahlias and yarrow) or red flowering plants (e.g. Rosa 'Flowercarpet red'). Great for bees and butterflies!